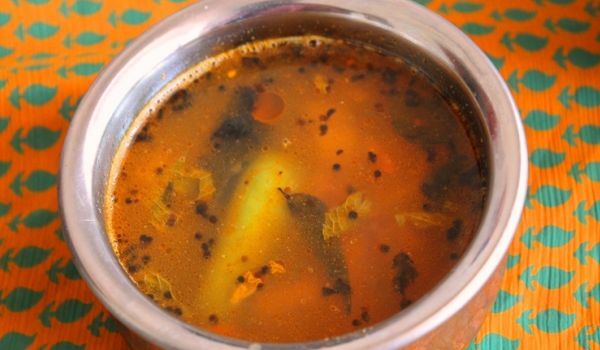 Dal Rasam is a very popular recipe. Learn how to make/prepare Dal Rasam by following this easy recipe. Mix tomato, turmeric powder, coriander leaves, and salt in a bowl. Keep aside. Cook the dal in a pressure cooker and mash it thoroughly. Take rasam powder and tomato mixture in a pan. Add salt and enough water to make a thin mixture. Bring to a boil. Stir in tamarind, dal, and water as required. Cook on medium flame until it starts simmering. Heat some oil in a small saucepan and splutter mustard seeds. Add curry ceaves and asafetida. Remove from heat and add to the prepared dal mixture. Cover to retain the aroma.